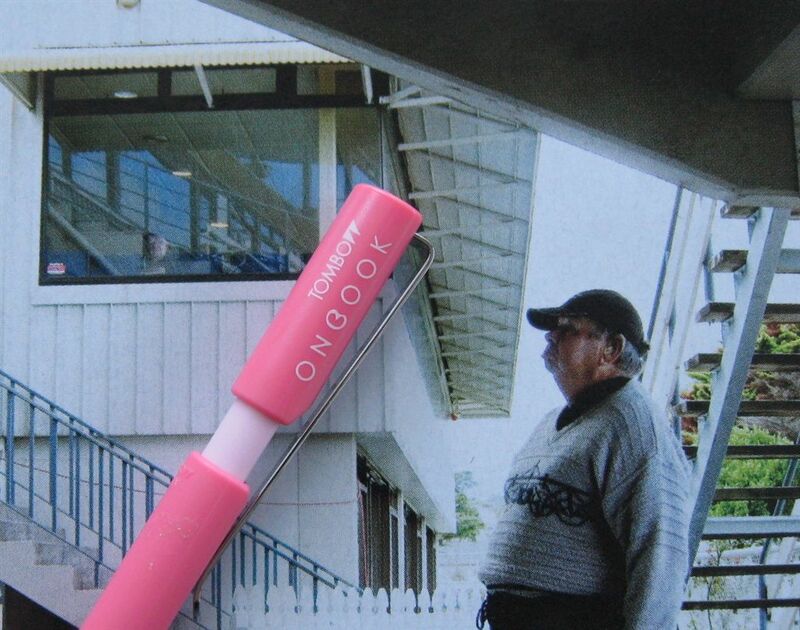 I first saw the Metaphys VISS eraser back in 2008 on the ISOT (International Stationery and Office Products Tokyo) Trade Fair website, and it immediately caught my attention. From what I can make out, Metaphys are a design cooperative that partner with a range of manufacturers and distributors to design products that the partner then sells under the Metaphys brand. A consortium brand as it were. In this case the Viss eraser is in partnership with フエキ Fueki (Fueki Nori Kogyo Ltd) a company whose primary business is apparently industrial glues and adhesives, but who also have some presence in the stationery market, particularly products for the construction industry, e.g. carpenter pencils. The idea behind the Viss eraser is simple. We all know that the nice sharp corners of a block eraser quickly become rounded and far less useful. 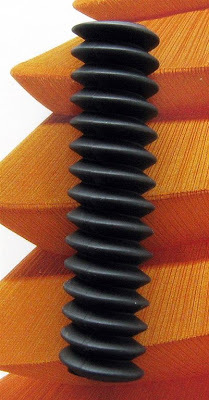 The screw thread or spiral design of Viss means there is always a sharp edge available, or at least that’s the theory. 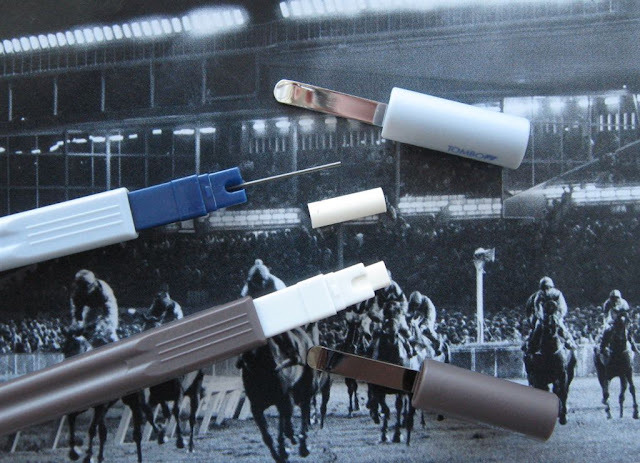 The Viss is somewhat similar in size to your standard block eraser – it is about 58mm long and 15mm diameter. At the time of writing it is available in white, orange and black. Metaphys state it is made from “elastomer resin” so that probably means it is what many others would call a “PVC-free and latex-free” eraser. In keeping with the premium stationery concept the Viss comes in its own little clear plastic container. Anyway, earlier this year I finally got around to getting a few of these Viss erasers to try. 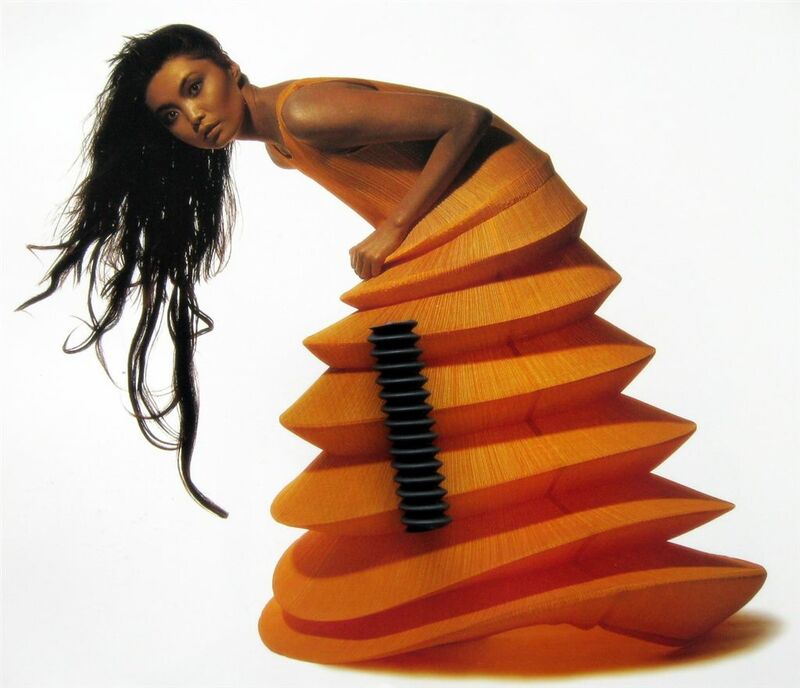 First off then, the spiral design provides an interesting sensation for your fingers every time you use it. An eraser and a fingertip massager all in one? 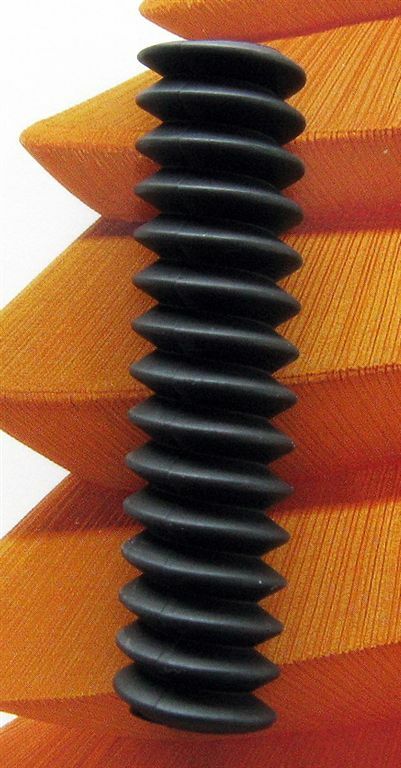 The main design concept of the Viss is that the spiral means you will always have a sharp edge available. Well, that’s a bit of a yes and no. If you hold the eraser at a relatively horizontal angle to use the edge as a thin line eraser then you will quickly wear down or blunt the peaks of the spiral. On the other hand, if you hold the eraser at a relatively vertical angle then you can use the outside edge of the spiral as the end point of what you are erasing. By that I mean you can easily erase up to a fairly well defined line from one side. The same as if you only ever held your block eraser perpendicular to the paper and just wore its end down without rounding the corners. It would still be a big fat eraser, but you could easily run the edge up to a controlled point when erasing. I think that’s the advantage of the Viss eraser, its design makes it much easier to do that. 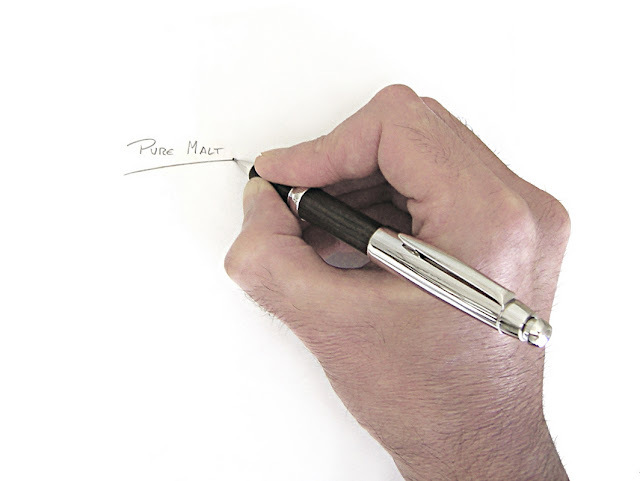 Much easier to hold it relatively perpendicular to the paper and erase up to a set point. It’s great for precisely erasing the first or last letter of a word, or even an entire word, but not so good at erasing a letter out of the middle of a word. Don’t get me wrong, you could make a reasonable attempt at erasing a letter from the middle of a word, by orientating the eraser horizontally to use a peak of the spiral but your vision is a bit restricted and the edges will blunt if used thus frequently. Of course you can re-sharpen them to some extent by later using the eraser vertically. All that aside though, long term, the spiral edges are never going to be as precise as a fine core stick eraser like Tombow Mono Zero, but they are sort of halfway between that and a traditional block eraser. The eraser waste of Viss twists up very easily into strands. Actually it twists up better than most. When you are doing some heavy erasing though it sometimes feels as if the eraser compound is starting to tear, or maybe even partially melt from the heat of surface friction? 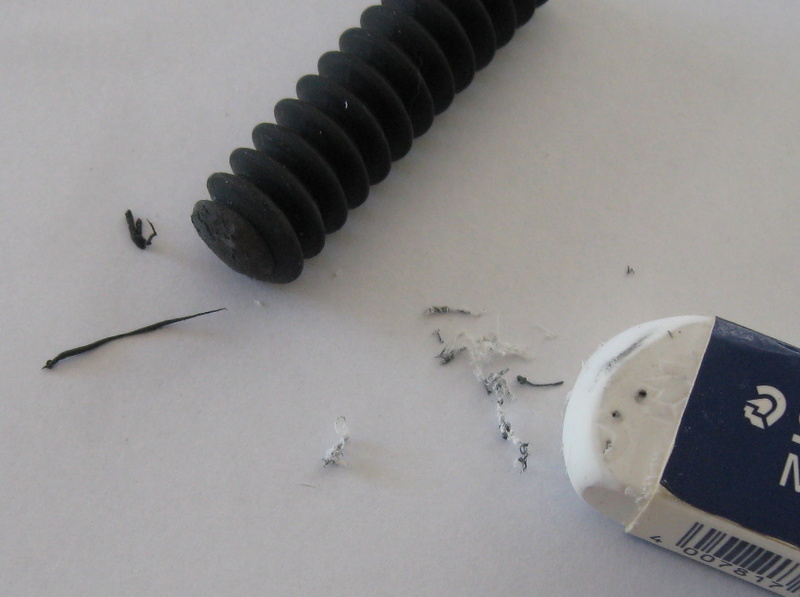 The eraser waste can bunch up too much and the surface of the eraser can be left looking a little torn or hairy. Right then, time to get serious and head on down to the lab and get our highly expereinced staff to put Metaphys Viss to the test against our benchmark eraser, Staedtler Mars Plastic. OK, first up, 0.5mm HB mechanical pencil lead. Let’s try again, this time really pressing the pencil lead hard into the paper to make it much heavier and darker. Again, pretty even, but perhaps Mars did a very slightly better job. Next then let's try some wooden pencils, starting with two coloured pencils. A clear but narrow victory to Mars. 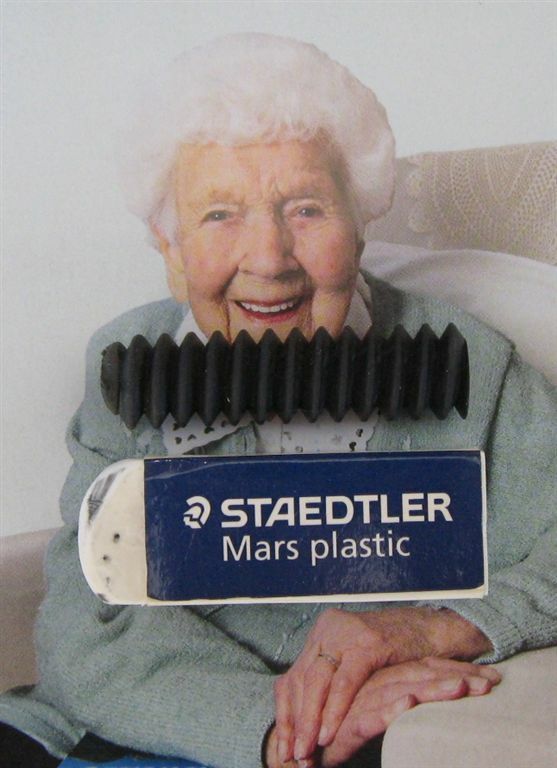 Basically Mars feels ever so slightly more abrasive in use and I imagine this was the secret to its success here. Now wooden HB grade lead. Another draw! Well maybe Mars was an absolute fraction better. But only maybe. Lastly then wooden 5B lead. Interesting. Mars certainly smears the lead about more. Overall it’s very close yet again, but if forced to choose a winner I think Mars erased better by a very small margin. Frankly, I am surprised. I used Viss for several weeks and I thought it had only average erasing power, and that Mars would clearly be superior when they went head to head. Overall then, I am very glad I spent my money to fly a couple of Metaphys Viss erasers across the ocean to my letterbox. Earlier in this review I described the Viss as “sort of halfway between that [Tombow Mono Zero] and a traditional block eraser”. Well being halfway between those two is a pretty good place to be. The Viss eraser looks cool, feels interesting in your hand, erases well, and the spiral design means you always have a reasonably sharp edge available. Get one and check it out for yourself. 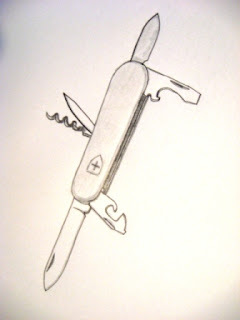 I’m rather partial to multi bladed knives and Victorinox brand Swiss Army Knives in particular. Not that I own many, but here’s my first one. 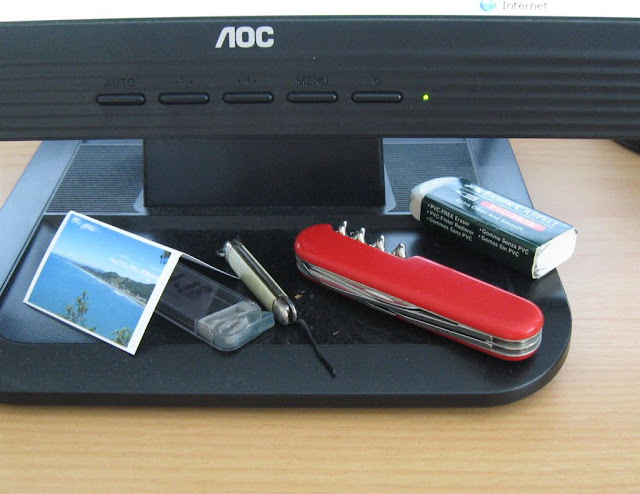 It lives on my desk and sees fairly regular use...opening up all those pencil packages! It was given to me about 25 years ago, by a friend of Swiss descent. It’s a very basic model. 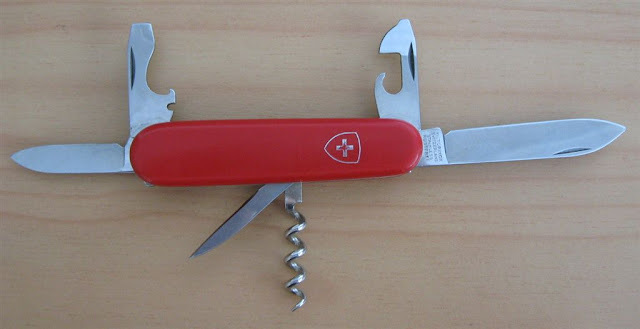 From what I can find on the web, I believe it is a long discontinued model, a “Standard”, although the blade is stamped "Economy" rather than "Standard" so maybe I'm wrong. Anyway, apparently Standard was a variation of Weekender and of Spartan. Weekender = Standard plus a key ring, and Spartan = Standard plus a toothpick, tweezer and key ring. There's no prize, other than honour and glory, but take a guess - one of the blades/implements on this knife is somewhat superfluous to the requirements of life in Kiwiland. You can hover your mouse over the right hand drawing of my SAK to see the answer. OK folks, here’s the second of Vikram’s guest articles. The first thing I thought when I saw this leadholder for sale was, “That’s a huge lead!” and at 5.6mm, I have never seen one like it before. I bought it in the Deutsches Historisches Museum in Germany, and like it very much. Disassembly reveals an all-metal inner mechanism - quality at its finest! Country of origin is not stated, but I am assuming it is Germany. The supplied lead is fantastic - a very soft lead (2B according to the manufacturer’s website) that does not smear very easily. Up top, the pushbutton twists off to reveal a sharpener - convenient! Overall, I would highly recommend this leadholder to anyone who sketches or draws - it is a great tool to have! Thanks again Vikram. Hope you are happy with your week. A while ago Vikram from Illinois got in contact with me and I persuaded him to do an article or a review for this blog. Well, the end result is that he sent in two articles, both on leadholders, because he quite rightly thought they were under-represented on this blog. So, this week is Virkam’s Leadholder Week, with two postings to publish. Here’s the first one. Firstly, I would like to thank Dave for this great opportunity! I have been interested in pencils for a while, and at 16, I think I am the only one of all my friends to love pencils so much. Faber-Castell: a name highly regarded in the pencil and writing instruments industry for high quality yet affordable products. As a drafting student, I was eager to try out one of their leadholders, the TK4600. 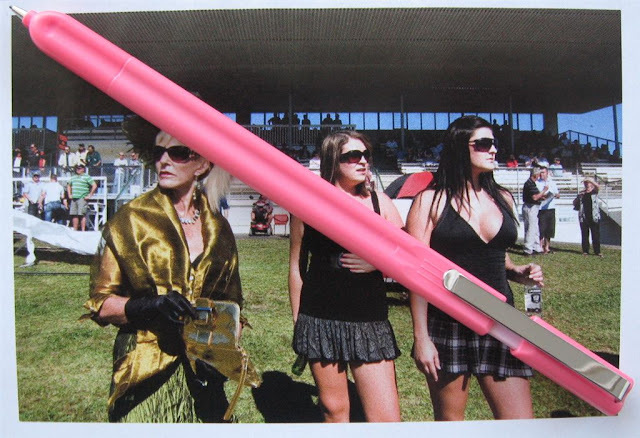 This 2mm leadholder is a normal, economy grade pencil. The balance point is almost exactly at the midpoint, making this an ideal drafting instrument. 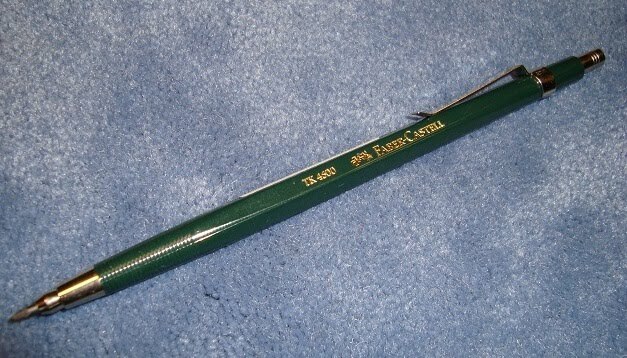 A forest green, hexagonal body, similar to that of their Castell 9000 series of drawing pencils, makes it clear that Faber-Castell associates this leadholder to that high standard. The all plastic body of the TK4600 is very solid, similar to the Pentel P205 - able to withstand abuse and still deliver - a student model, for sure. The foil stamping on the body clearly states “TK4600 Faber-Castell” with “Germany” stamped in small letters on the clip. The metal tip section, (removable?) clip, and pushbutton show that Faber-Castell did not skimp on quality with this one. The grip of the TK4600 is aided by the ridges toward the front of the pencil, but they do not really help; when drafting, the draftsman generally holds the pencil farther away from the tip-closer to the midpoint. Maybe this was conceived as a multi-use pencil; one for occasional writing and sketching as well as drafting? While writing with the TK4600, it was very clear that it is not a writing tool primarily - after a half page, my hand started to develop a painful cramp. Sketching and drafting is comfortable, and this is plainly the TK4600’s forte. Another, slightly shorter version, the TK9500, has “HB” stamped into the body, making it seem like more of a sketching and writing tool than the TK4600. The TK4600 is a student leadholder, and a good one at that. However, the lack of a built in sharpener, higher price point (about USD $16, $12 for the TK9500) and the small grip section push me toward the Staedtler Mars 780 technico leadholder (USD $3-5) as a general leadholder. However, this one remains highly recommended! Overall: highly recommended, but consider Staedtler as well. Thanks Vikram. Posting No. 2 coming in a few days. Over the years of this blog I have made quite a few pencil-friends. Somehow, my correspondence with several of these pencil-friends rapidly turned to drinking...tea that is...so it should therefore come as no surprise that when I was first in contact with Ricardo from Portugal he quickly reminded me that I drink tea because my cultural heritage has strong roots back to Britain where, in the later 17th Century, tea was first popularised by the young Portuguese royal, Catherine of Braganza, the queen consort of King Charles II of England, Scotland and Ireland. But tea is not the only beverage of importance in the world, for instance there is also whisky, 'uisge beatha' - 'the Water of Life'. Far, far away from its origins in Scotland and Ireland, that Water also has its place in Japan, where they also take their tea seriously. One day as I sat at my wintery Antipodean window sipping tea, an email arrived from sunny summery Portugal, where Ricardo was no doubt shading himself as the ice clinked and the Water was cool and refreshing. Here then, is a guest review by Ricardo from Portugal on one of his favourite mechanical pencils, a pencil steeped in Watery tradition. Mitsubishi Pure Malt Oak Wood Premium Edition [M5-5015] 0.5mm mechanical pencil. 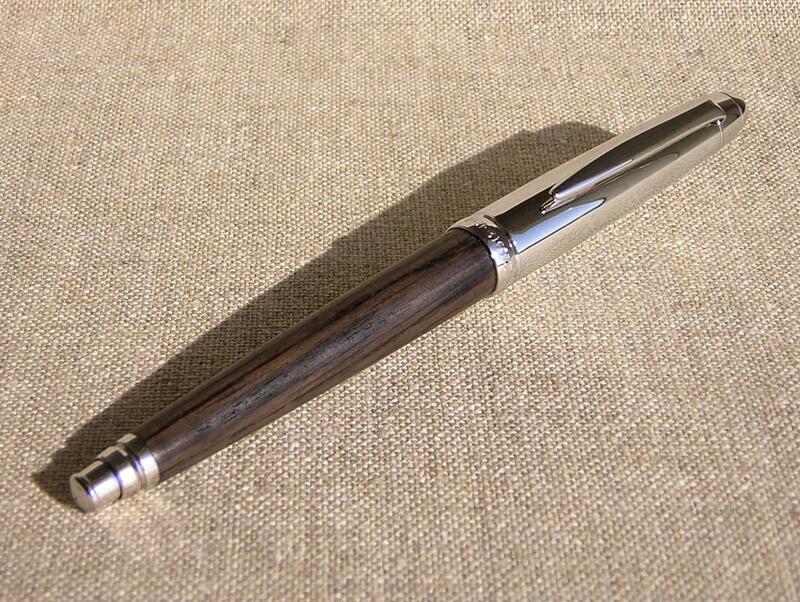 Mitsubishi Pure Malt Oak Wood Premium Edition [SS-5015-P10] 1.0mm ballpoint pen. 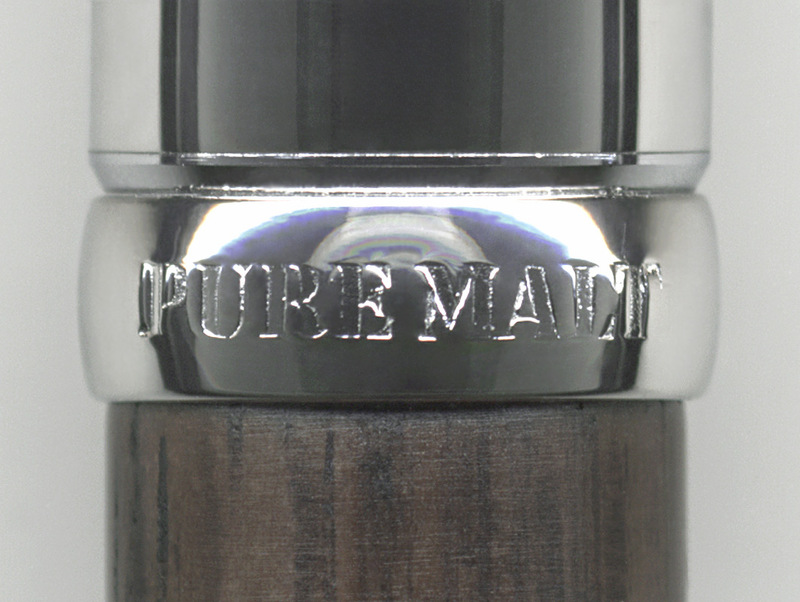 Mitsubishi Pure Malt Oak Wood Premium Edition [MH-3005] 2.0mm lead holder. Mitsubishi Pure Malt Oak Wood Premium Edition Multi Pen [MSE-3005] 0.5mm mechanical pencil and 0.7mm black & red ball point pen. 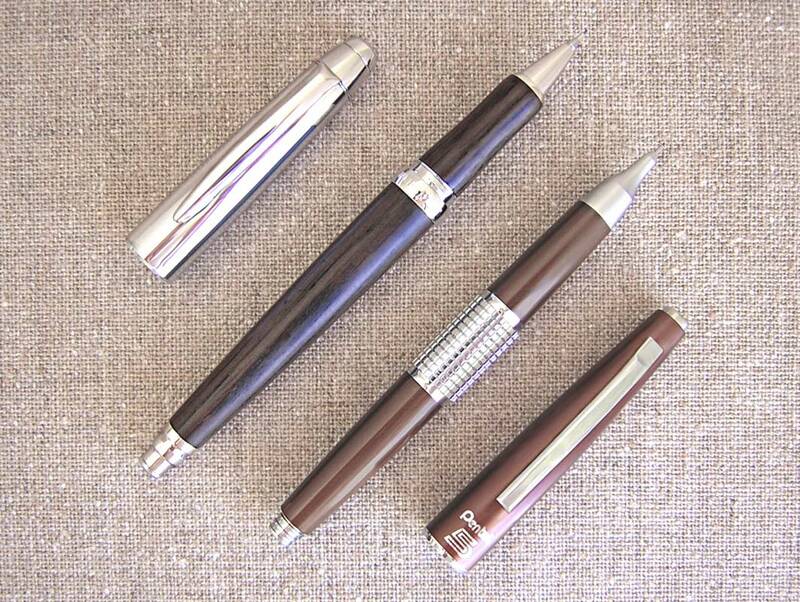 Mitsubishi Pure Malt Oak Wood Premium Edition [M5-2005] 0.5mm mechanical pencil. 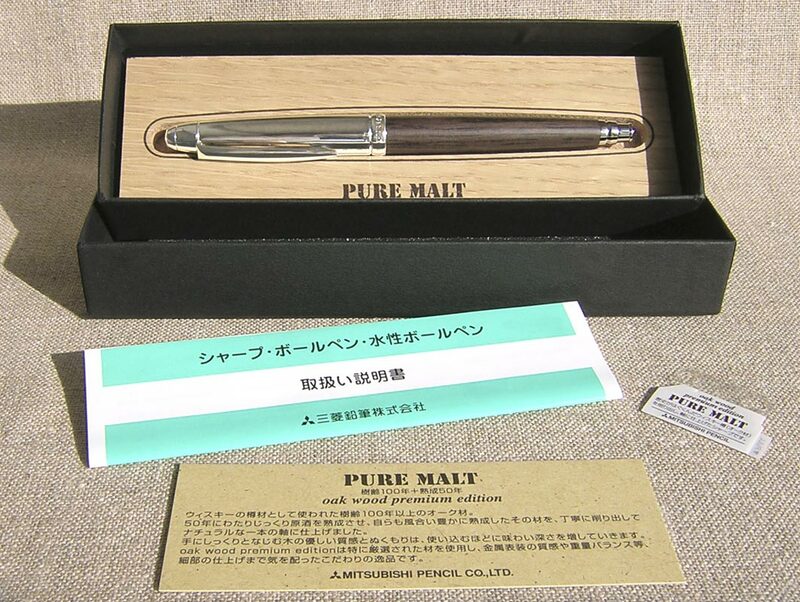 Mitsubishi Pure Malt Oak Wood Premium Edition [SS-2005] 0.7mm ballpoint pen. All these products have one thing in common, the high quality materials they are made of - chrome plated stainless steel and recycled dark oak wood. Mitsubishi claims the wood is over 100 years old and I read an official press release that says it's 150 years old and was used before in the form of casks to age whisky for at least 50 years, which is why the wood is so dark - no pigments, dyes, waxes or varnishes of any kind were used to achieve this rich dark brown hue, just time and The Water of Life (lots of both). It then took another 50 years for the wood to get completely dry and to be free of the characteristic whisky smell - the wood is completely odourless. This pencil is then a unique and magnificent combination of very old and space age materials! 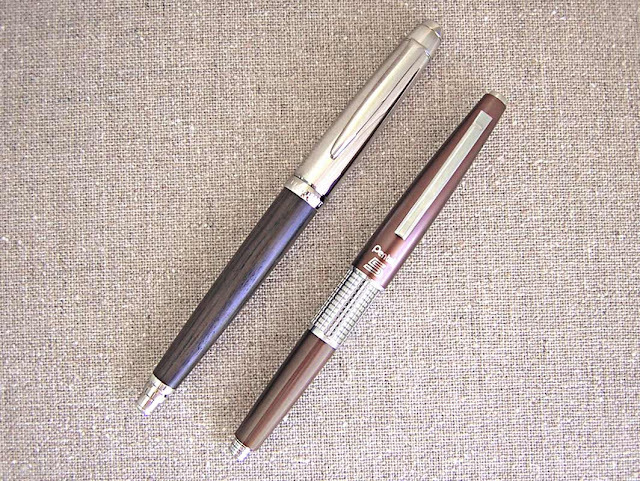 The subject of this review, the Mitsubishi Pure Malt Oak Wood Premium Edition [M5-5015] 0.5mm mechanical pencil is the top of the line and its appearance is striking. To me it is one of the most beautiful mechanical pencils I have ever seen and one of the best I've had the pleasure to use. It can easily be mistaken for one of those luxury products that cost a small fortune, it was marketed as such and really is a luxury product, but it is just not that expensive because there are no precious materials in its composition. The quality of construction is superb, Mitsubishi did an amazing job. 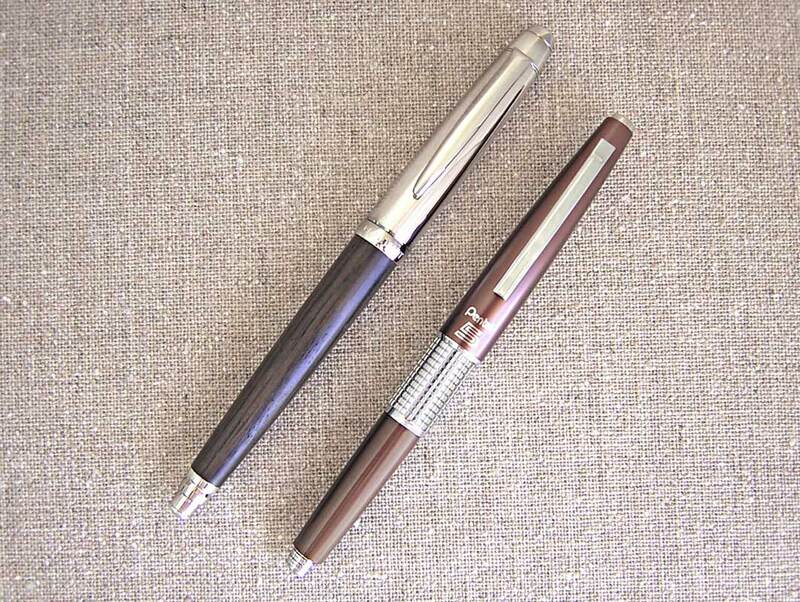 I don't know if capped mechanical pencils like this were invented by Pentel or even if the Kerry was the first of this kind but I can only say without a doubt that Mitsubishi went a step further and improved it in a way I never thought possible. With its short 2mm fixed sleeve this is a pencil suited for writing, drawing and sketching though it can also be used with some rulers and templates. As I said before the concept of this pencil is basically the same as the Pentel Kerry [P1035 AD], another favourite of mine (I actually carry a black one with me most of the time), but the Mitsubishi is way too precious to be carried around so it stays at home. By being slightly heavier and bigger than the Kerry, the Mitsubishi is a much better pencil in my opinion, also, because it is made out of wood it retains the warmth of the user’s body in a way plastic can’t. The wood polishing also provides a feeling to the touch very similar to silk without losing the wood's texture, so using it really is a very pleasant and unique experience. 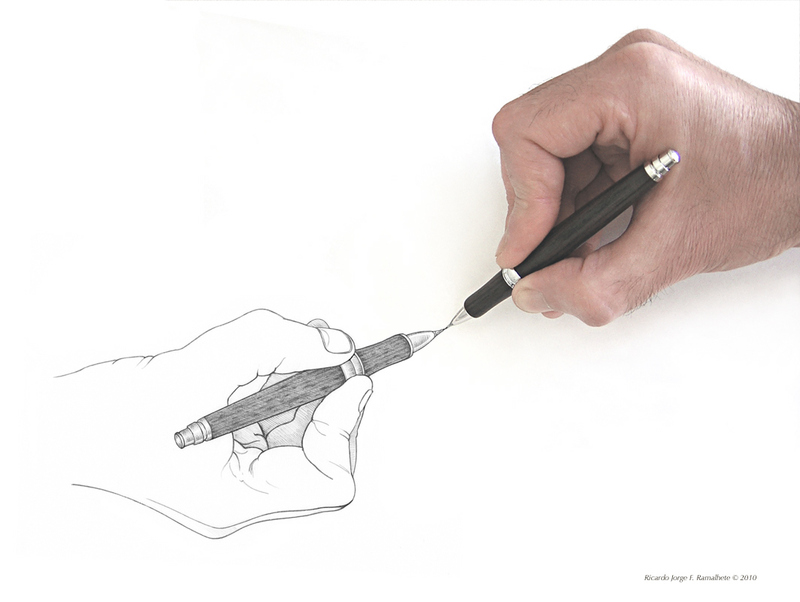 The grip has a concave design which works very well both for precise drawing and writing. There are no issues at all on griping this pencil, and just above the grip there's a metal ring which acts like a cap lock and works as a counter-weight when the pencil is used without the cap, moving the balance point to approximately 1cm above it, also, the only inscription on the pencil, the words Pure Malt, are embossed in it. At first I was afraid the ring would be very inconvenient as it could dramatically reduce the grip area and could interfere in the way I usually hold my pencils, but I was wrong, it actually helps when I need to use the pencil to make quick sketches or cover large areas with graphite. On such occasions I usually hold the pencil 2 cm above the centre of the grip, with the M5-5015 that's 4cm above the tip of the sleeve, precisely where the ring is located so I just hold it by the ring to obtain an optimal positioning of the pencil between my fingers. The conical shape of the barrel is excellent for rotating the pencil in order to keep the lead sharp if needed (no need for a Kuru Toga Turn Engine here). As I said this pencil also has a "writing mode", when posted (with the cap on) the centre balance is moved 7.5cm above the tip of the sleeve which is excellent for this task. 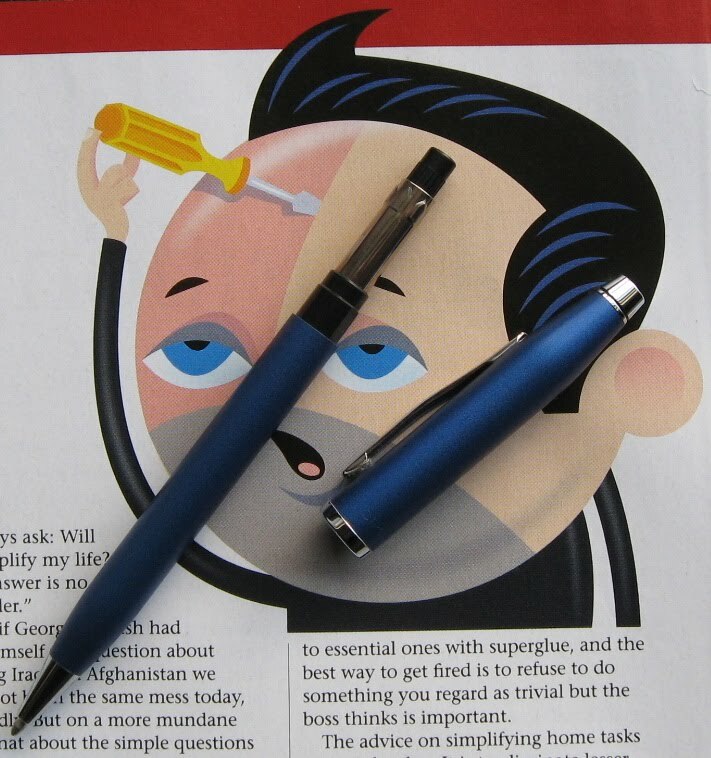 The cap doesn't wobble when posted and the pocket clip, besides being very well designed and beautiful, is very robust and secures the pencil very well to most pockets as it has some springiness. Naturally as a capped pencil it is totally pocket safe. This pencil is heavy, 26.3g posted, so conveniently the mechanism has a very short incremental advance which helps prevent lead breakage. With the lead fully retracted the first 2 clicks will advance it by 1mm and 10 clicks gives approximately 6mm of lead. One final note goes to the presentation of this product, which is very complete. It comes sealed in a cellophane sleeve with a transparent acrylic tag attached to the pocket clip stating the model name, reference number, lead size, price and a couple more things written in Japanese which unfortunately I cannot read. 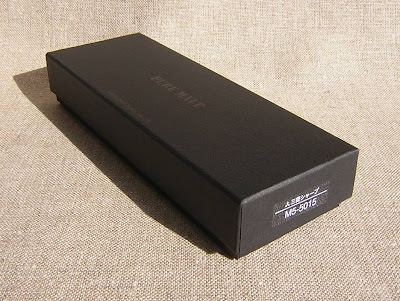 The box is a matte black cardboard box with glossy imprints. On the inside there's a detachable rectangular piece of corkwood cut with the shape of the pencil on one side and two identical ones on the other, meaning that two instruments can be stored in it. As well, an instruction manual and a small card written in Japanese that I assume to be some information about the Pure Malt line are also provided, along with a rectangular piece of black foam used to prevent the pencil from being loose when the box is closed. 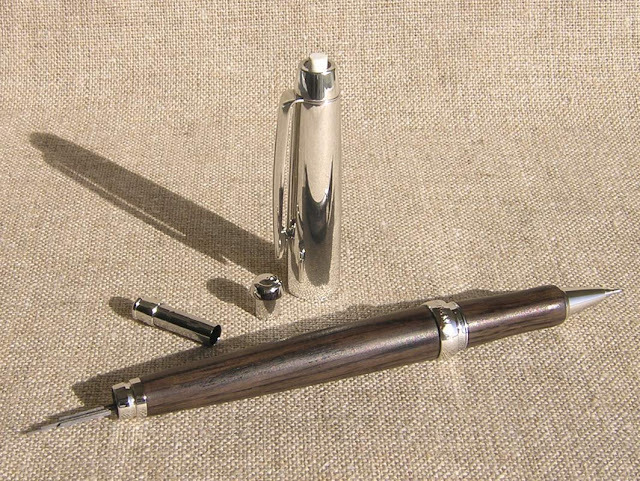 I would dare to say the Mitsubishi Pure Malt Oak Wood Premium Edition [M5-5015] 0.5mm Mechanical Pencil is much more than a great writing instrument, as besides being one of the finest examples of Mitsubishi Pencil Co. Ltd. craftsmanship, it is also a work of art, of industrial design and an ode to mechanical pencils. Composition : High quality chrome plated stainless steel, dark oak wood. Full metal mechanism and lead reservoir. Eraser under the cap's push button. Thanks for this review Ricardo. I envy your artistic skill. Well, I guess its time for some more Water, be it brewed or distilled. 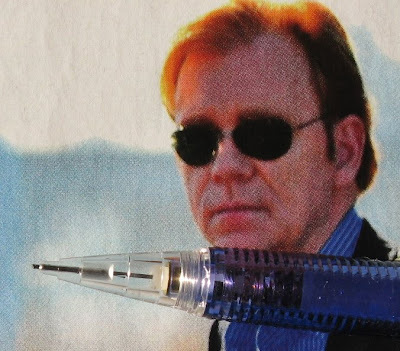 The shameful truth is out, Dave cannot live by pencil alone. He also requires ink. A bit over a year ago I decided to push the boundaries and every time I went to use ink I asked myself the question “Do I really need to use ink for this? If I used pencil and someone erased it, or altered it, would it matter? 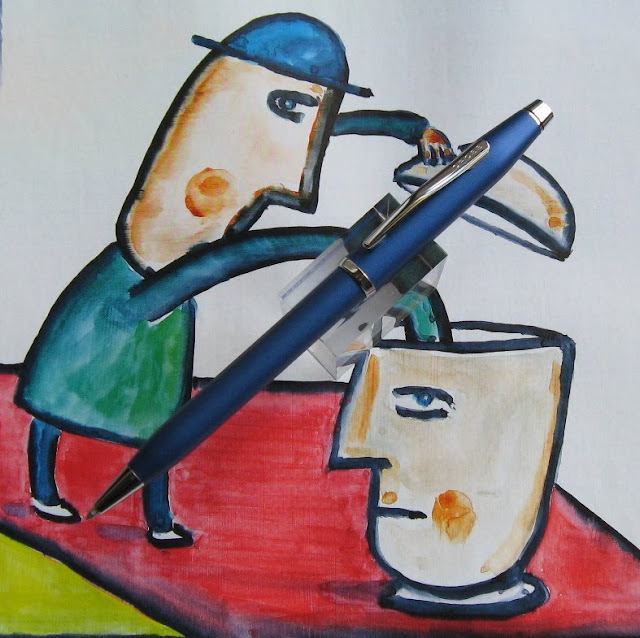 More to the point, would it hurt me?” The answer was usually “No” so I started using pencil for even more things – signing memos and purchase orders at work, signing bank cheques (but still writing the amount payable in ink) and so on. No one has ever challenged me, and nothing bad has ever happened. Still, as loathe as I am to admit it, the permanence of ink does have its uses. Only a real idiot would fill out the amount payable on a cheque in pencil, and the G-man insists on ink when you fill out your passport application form which seems fair enough. So, on those rare occasions that I reach for ink, here’s what usually ends up in my hand - the Cross Century II ballpoint pen, in royal blue with chrome trims. Cross item 412WG-24 to be precise. When it comes to writing instruments blue is one of my favourite colours, and this is a nice deep semi-lustrous blue body. Twist action to advance and retract the tip. 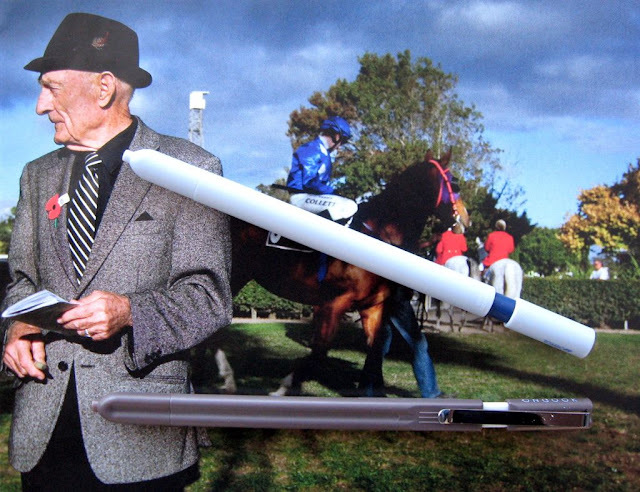 The top half of the body pulls off to replace the ballpoint pen refill. I use black ink. I occasionally hear a small squeak from the twist mechanism, but pulling the top off and back on seems to fix it. Here’s my review of the Cross Century II mechanical pencil. This is a different sort of review, more pictorial rather than text. This time I’m letting my camera do the talking, rather than my fingers. 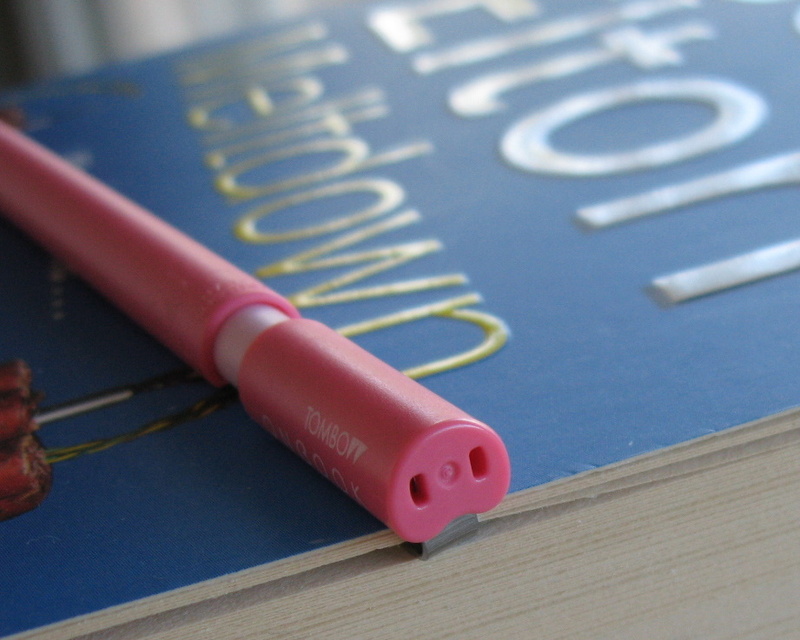 The Tombow Onbook is currently available as a ballpoint pen and as a mechanical pencil. 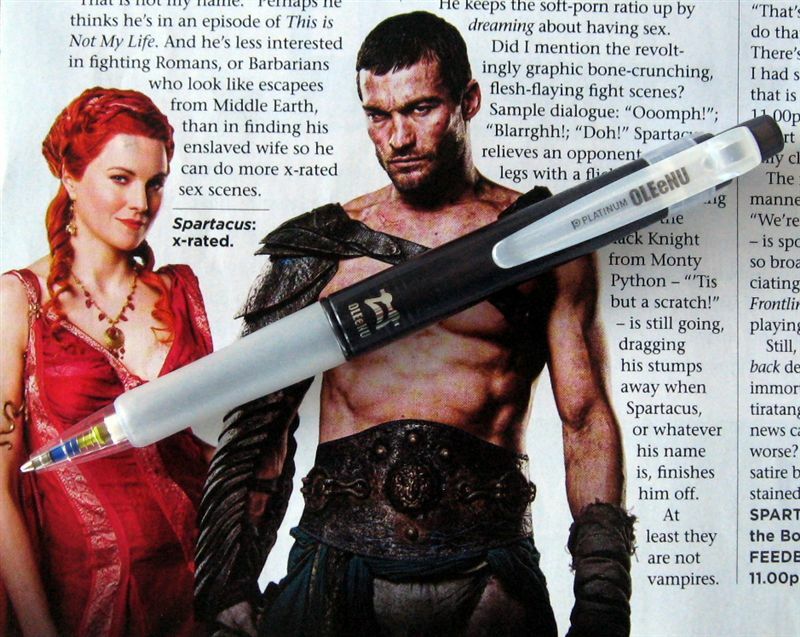 I will of course be confining myself to the Onbook mechanical pencil, which has a style number of SH-OBxx. 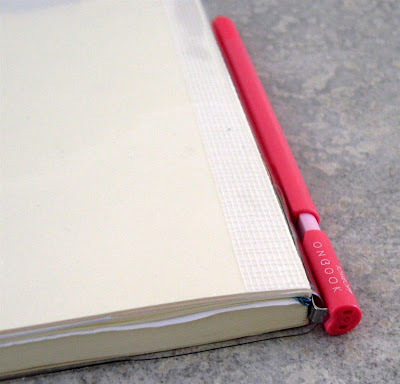 Designed to clip to and fit snugly down the spine of a notebook, hence the name Onbook. Of course it also fits nicely to the cover of a book too. A somewhat suggestive end on the top cap. Long straight slim lay-flat smooth lines are a necessity for a pencil designed primarily to be clipped to books. Note the unusual cross-section of the body. About 1/3rd of the circumference is pushed in to make a concave section to assist in fitting snugly to whatever it is clipped to. The unusual body cross section does make for an unusual writing experience. It’s fine for a few notes and other short term use but this is not really a pencil for writing a novel with. I imagine Onbook would be entirely suitable for bookies. The sleeve is retractable for pocket safety. 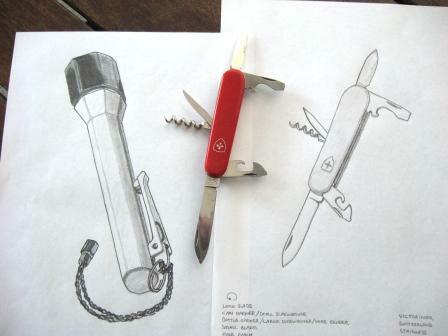 The pocket clip is a strong steel clip, firmly sprung against the body. Note how the pocket clip is attached at the very top of push top button so the pencil won’t stick out up past the top of the book it’s clipped to. This does mean there is a risk of the main body inadvertently detaching from your book at some inconvenient time, but the top button is very firmly press fitted to the main body so the risk is minimal. Well at least while the pencil is reasonably new. Very small eraser under the push top button. Lead refill chamber beneath the eraser as usual. Dimensions – Length 137mm, diameter 8mm before part of it got squashed in. 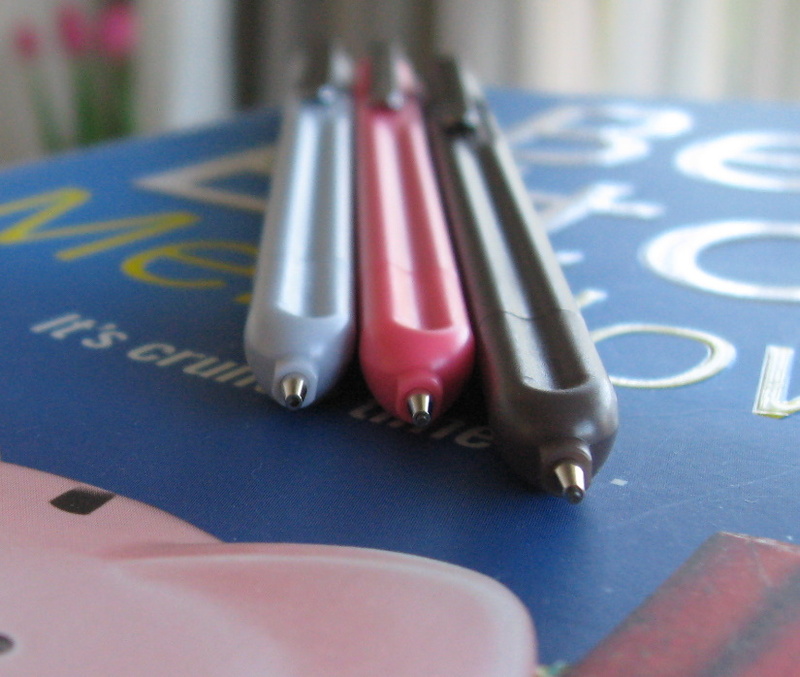 The Tombow Onbook mechanical pencils featured in this review were gifts from Cult Pens. Just FYI, I have changed the Comments set-up on this blog back to using a separate pop-up window rather than the inline comments. Comments on Blogger blogs have always had a few problems when using the inline comments, particularly for Firefox users, and some recent changes seem to have made things a little worse. I much prefer inlne comments, but just for the moment I"ll revert back to pop-up and monitor things. Also, in case you haven't noticed, there are new gadgets in the sidebar - including The Most Viewed Pages for the last rolling month. Rather than reviewing a mechanical pencil, in this post I’m reviewing a mechanism. 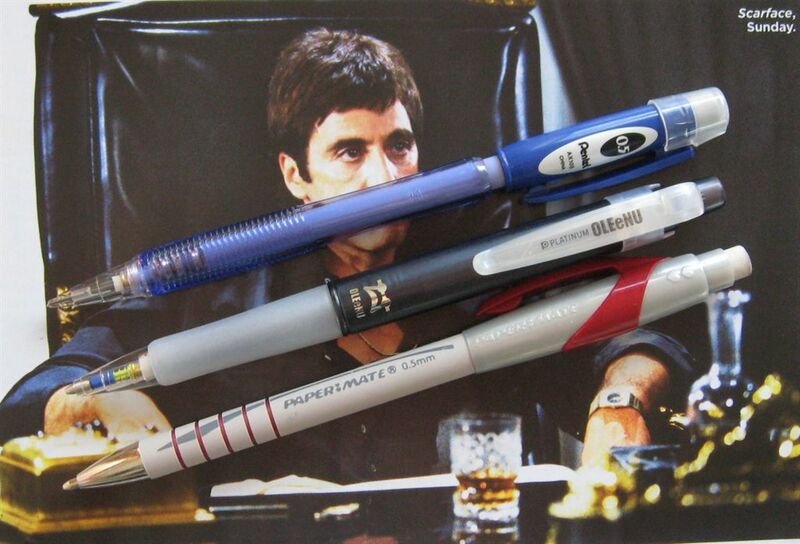 In August 2009 Platinum Pen of Japan announced the release of their OLEeNU range of mechanical pencils. So, what does OLEeNU mean? Well I don’t really know, but the English language version of the Platinum website says “‘OLEeNU’ mean that the lead is not broken easily when you drop off the pencil or take writing.” I’ve also been told that it means “unbreakable”. Anyway, let’s forget about the finer nuances of the translation, the effective meaning of OLEeNU is abundantly clear. It is a mechanism that, amongst other things, claims to significantly reduce lead breakage caused by shock to the pencil, for example if the pencil is dropped to the floor. 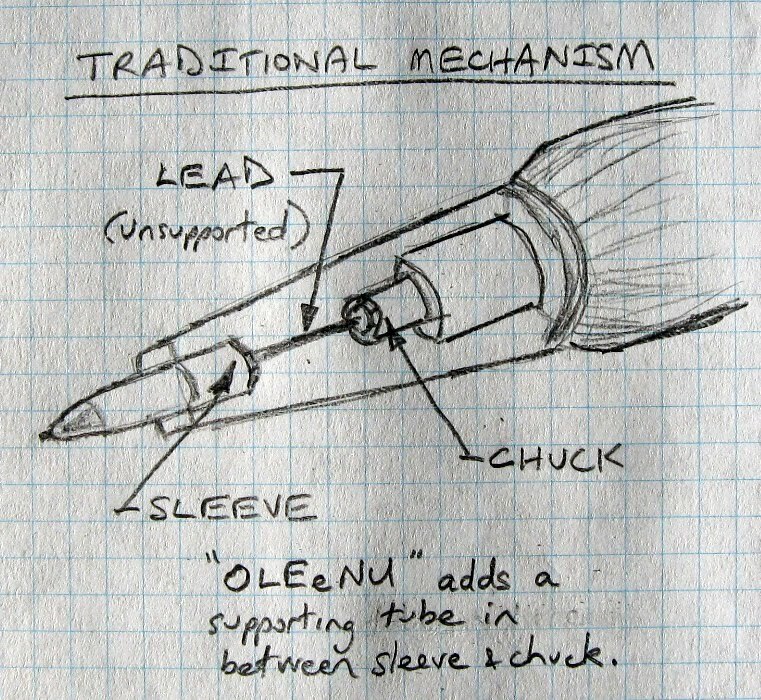 It essentially does this by having a tube which supports the lead in between the chuck and the sleeve, thus reducing the chance of a lead break between the two. Check it out. 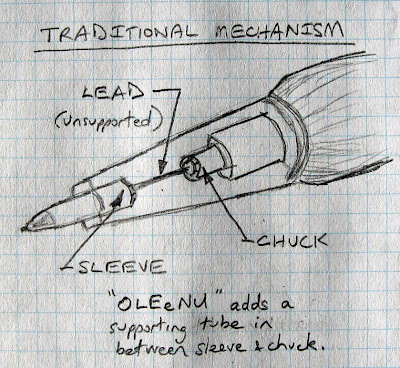 See how the lead is unsupported between chuck and sleeve in this ordinary non-OLEeNU mechanical pencil. So, personally I don’t have a lot of trouble with this sort of lead breakage, but recently I received a parcel of pencils from overseas and…you guessed it…every single pencil had a broken lead in its tip. The parcel and the pencils were all outwardly undamaged, but clearly somewhere along the way they had taken a right beating. So, OLEeNU popped into my mind. Would OLEeNU mechanisms have made any difference? Time to head on down to the mechanical pencil test laboratory. Movies involving animals frequently carry a disclaimer along the lines of “No animals were harmed in the making of this movie”. 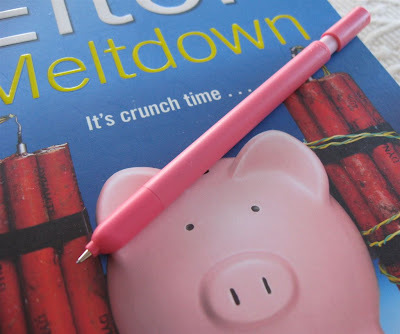 Well, I’d like to say “No mechanical pencils were harmed in the writing of this blog post” but that be would a damn lie. The pencils involved in this article were treated harshly and may never recover from their grievous injuries. Those of a delicate disposition or squeamish nature should read no further. Top to Bottom: Pentel Fiesta, Platinum OLEeNU MOL-200, and Paper Mate Flex Grip Elite. ﻿﻿I loaded each pencil with the same brand of 0.5mm HB lead. I’m not going to say which brand, suffice to say it’s a brand that I don’t think has particularly good strength. Before each test the lead was advanced until it just emerged from the sleeve and then carefully pushed back in so it was flush with the end of the sleeve. Now then, let the games begin. I held all 3 mechanical pencils horizontally and dropped them simultaneously onto the concrete floor of the test lab. They hit the deck and bounced freely. A total of five drops were carried out with the drop height randomly varying between “waist high” and “shoulder high”. The results were convincing. The Fiesta lead broke in 4 of the 5 drops, the Flex Grip Elite broke in a different 4 out of 5, and the OLEeNU didn’t break in any of them. I won’t bore you with the details of a few more pencil crash and bangs around the lab because the results are just more of the same. The champion is clear. I’m the type who takes all these claims of “super new and improved” with a big dose of cynicism, and regard most such claims as little more than marketing department dross. This time though I believe the advertising is true, the product performs as claimed, the lead in an OLEeNU mechanical pencil really “is not broken easily when you drop off the pencil or take writing.” It may not be unbreakable, but it’s getting close.